Every time Fall and Winter arrive, my RumChata bottles go quick. From adding a shot to coffee or hot cocoa to making some great rum or whiskey based cocktails with it, the cinnamon and horchata flavors make it easy to create a great cold-weather drink. Alternatively, you can serve “up” in a chilled cocktail glass with no ice. Enjoy this Fall cocktail from our sponsor RumChata! This entry was posted in liqueur, recipes, rum and tagged rumchata, rumchata cocktails, rumchata recipes, spiced chata on October 27, 2018 by Greg. This rum, dubbed Stiggins’ Fancy Plantation Pineapple Rum, was only given by Wondrich to friends at Tales of the Cocktail 2014. As the legend of this special rum grew, Plantation realized there was enough demand to actually bring it to market, and the retail version of Stiggens’ was born, and it won Best New Spirit at the most recent Tales of the Cocktail Awards (2016). Let me clarify that this is no “flavored rum” as we’ve come to know it under, say, the Malibu moniker. 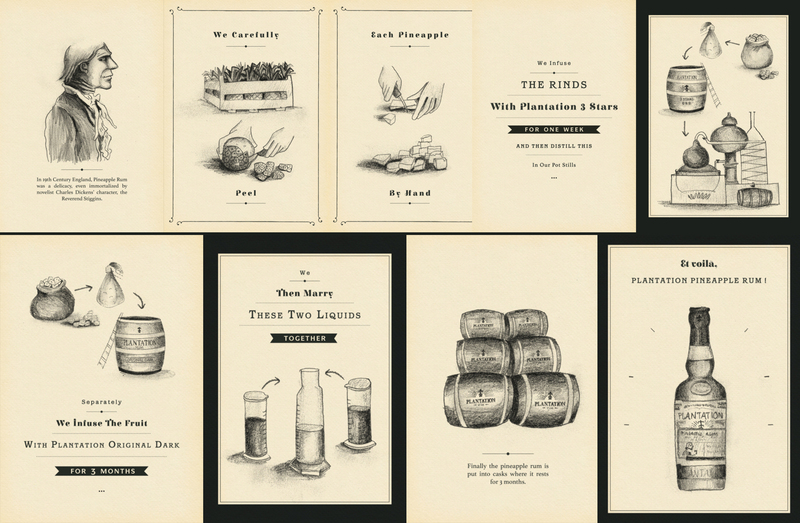 This is quality, artisinally-produced fruit infused aged rum, and the end product shows. Outside of actual pineapple, no flavor is added, and no sugar either. It’s an amazing sipping rum, just on the rocks and makes some beautiful cocktails. For $30, it may be one of the most unique products you can buy at you local liquor store. This entry was posted in reviews, rum and tagged charles dickens alcohol drinks, charles dickens cocktails, david wondrich, david wondrich history, david wondrich rum, flavored rum, good flavored rum, pickwick papers, pineapple rum, quality flavored rum, reverend stiggins, stiggens fancy, stiggens fancy pineapple, Stiggins' Fancy Plantation Pineapple Rum on February 13, 2017 by Greg. When I started Simple Cocktails, I noticed that usually, the classic cocktails are the simplest. A balanced drink is often an issue of a bit of trial and error, too, to get the ratio of liquor and mixer just right. I’m excited to have Q Drinks on board for this drink in particular, because I feel like soda’s become more and more sweet these days from it’s original makeup, which was a bit spicy balanced with sweet, with notes of clove, cinnamon and vanilla. Q Drink’s Kola is just that, though, a less-sweet traditional cola that makes a killer cocktail mixer because it allows you to make a balanced cocktail, and mixing Kola with rum, which also has some great caramel and cinnamon notes, is a match made in heaven. This entry was posted in recipes, rum and tagged cuba libre, cuba libre cocktail, q drink, q drinks, q drinks kola, q drinks kola cocktail, q drinks kola cuba libre, q drinks kola review, rum and coke on February 6, 2017 by Greg. I’m a little embarrassed to say that until recently, I had not tried cachaça (kuh-CHA-suh), the Brazilian sugar cane juice liquor. Similar to rum, cachaça is Brazil’s most popular distilled spirit, and the base for the caipirinha (KAI-pir-een-yuh) cocktail. Well, Novo Fogo Cachaça helped us to correct that when they sent us their caipirinha kit to try out on our podcast (which we did here). The kit includes a bottle of Novo Fogo Silver, 2 small branded mason jars, and a wood muddler, all of which we use in the recipe below. This entry was posted in recipes, reviews, rum and tagged brazil cocktial, brazilian cocktail, Cachaça, caipirinha, caipirinha cocktail, Novo Fogo Cachaça on April 29, 2016 by Greg. We recently had a little fun on the podcast at the expense of Twenty Boat Spiced Rum. A rum from Cape Cod? If you heard the episode, however, you noted how quickly the jokes ended when we tasted Twenty Boat. Distilled by South Hollow Spirits in Massachusetts, who distills both Twenty Boat Spiced and Twenty Boat Amber Rum, this is a spiced rum to try if you see it (it’ll run you about $45 a bottle). With spices like vanilla, cinnamon and chai in the mix, Twenty Boat ends up lead by a strong butterscotch note most of all. I love to use spiced rums in my rum-and-cokes (made in a 1:3 ratio) because the spices in the rum usually closely pair and complement the flavor or Coke, and Twenty Boat fits the bill. I’ve found that if a spiced rum isn’t strong enough and spiced enough (duh), that it tastes too watery and bland. Twenty Boat doesn’t suffer from wither of these and it comes in at a impressive 95 proof. Because of the high proof, Twenty Boat is a decent sipping rum too, and a good pairing on the rocks with a cigar. This entry was posted in rum and tagged american rum, american spiced rum, cigar pairing, cigar pairing rum, spiced rum, spiced rum review, twenty boat, twenty boat spiced, twenty boat spiced rum, twenty boat spiced rum review on February 8, 2016 by Greg. Tea cocktails are most definitely a thing, from teas designed specifically for cocktails (like the Owl’s Brew) to many ways of infusing tea into booze, even smoking tea into it. Tea can add two great dimensions to a cocktail: lightening the alcohol content or adding a plethora of flavors into a drink that you don’t usually get through alcohol and mixers alone. 10th Avenue Tea is a new tea company with a specific passion for the environment. Available in 4 flavors: Green, Chai, English and Tropical, 10th Avenue gives you a unique option for how to work your tea into cocktails, though: because their tea is concentrated and dry, you can adjust tea strength on the fly and mix drinks quicker than if you were using pre-made teas or teas you have to brew before you use. Note I made the exact same drinks above but substituted Green tea for Tropical and Chai for English on a recent podcast episode. They also turned out great, but the Green/Spiced Rum drink was a runaway favorite. This entry was posted in recipes, rum, whiskey and tagged 10th ave, 10th ave tea, 10th avenue tea, 10th avenue tea cocktails, instant tea, instant tea cocktails, tea cocktails on December 7, 2015 by Greg. November 8 is National Harvey Wallbanger Day. The signature cocktail of Galliano Liqueur, and likely invented in the 1950’s in California, the Harvey Wallbanger grew in popularity throughout the 60’s (especially in California). The Sycamore Den bar in San Diego has given the original recipe a little twist in the Hardly Wallbanger. We also made this cocktail on our most recent podcast. Enjoy! Special thanks to our sponsor Galliano L’Autentico. This entry was posted in liqueur, recipes, rum and tagged galliano, galliano cocktail, galliano cocktail recipe, galliano hardly wallbanger, galliano harvey wallbanger, hardly wallbanger, harvey wallbanger, vodka galliano recipe on November 6, 2015 by Greg. It seems every liquor bottle comes with a legend of some sort, and Brugal Rum is no exception. A five-generations-old rum that’s both sourced and produced in the Dominican Republic, Brugal has a line of rums with vary age statements. For your entry-level $25, you get Brugal Especial Extra Dry. Keenly wrapped in a net of string, Brugal is unique in a way that many silver rums are not: it’s barrel-aged. After distillation, Extra Dry is aged 2-5 years in oak casks, then the color imparted from the casks is filtered back out. Usually a silver rum is not aged, and because of that, it’s not particularly flavorful, maybe a step up from vodka. But in the case of Brugal, you get a huge nose of woodiness, and a spicy, bold, and very dry rum. Though a common rum complaint, you won’t catch anyone saying this particular rum is “too sweet” for them. As I tend to prefer my Daiquiris to have a lot of character, meaning I prefer to mix them with aged rum, Brugal gives me a great alternative to the usually-murky brownness that you get with aged rum, then allows me to mix a flavorful-yet-light Daiquiri instead. You may recall from our Tales of the Cocktail interview that Fabian preferred Brugal in his Daiquiris as well! Cheers Fabian! This entry was posted in recipes, reviews, rum and tagged Brugal Especial, Brugal Especial Extra Dry Rum, brugal rum, dominican republic rum, dominican rum, dry rum on September 18, 2015 by Greg. 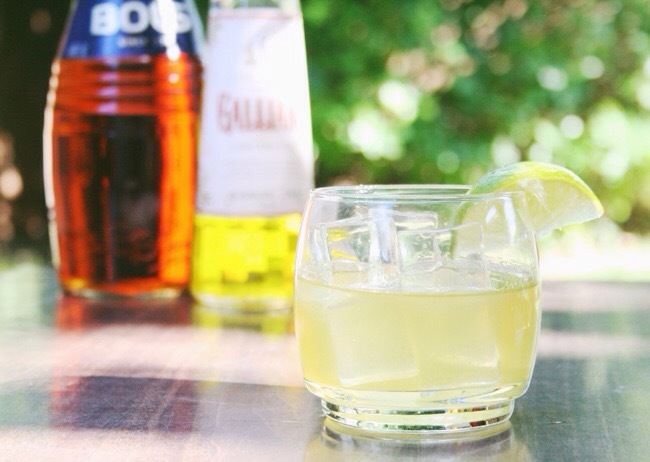 Galliano’s vanilla-and-spice flavor profile makes is a pretty flexible liqueur in many different types of cocktails, from light and fruity to rich and savory. In the spring, we mixed Galliano with tequila in an Hola Harvey, and now it’s time to mix Galliano in a tiki drink. Triple sec is clear and based on neutral spirits. Cointreau is a triple sec. Curacao is usually brownish, though can be orange or blue. It has color is because it’s brandy-based and sometimes aged, which also means curacao tastes richer. Grand Marnier is a curacao. This entry was posted in liqueur, recipes, rum and tagged galliano, galliano and rum, galliano harvey wallbanger, harvey wallbanger, harvey's tiki hut recipe on August 10, 2015 by Greg. It’s interesting how, after blogging about booze and cocktails for 5 years, you miss things. I’ve had a few bottles of Sailor Jerry Spiced Rum in the last several years, but I realized that I haven’t actually written about SJ yet! I’m just going to tell you that Sailor Jerry is my favorite spiced rum (Breckenridge is my 2nd fave). There are several things that make it a stand-out from competitors (such as Bacardi Oakheart or Captain Morgan). First, Sailor Jerry is higher alcohol at 46% – Oakheart and the Captain are 35%. SJ is also commonly sold in 1L bottles (as opposed to 750ml) in many places. The flavor of Sailor Jerry Spiced Rum is the biggest differentiator, though. It’s less sweet-tasting, yet remains smooth and palatable. It is great in a Rum and Coke as the spices of SJ, like clove, cinnamon, and vanilla, are almost a one-for-one companion to the flavoring in Coca-Cola. Compared with it’s competitors, who offer a fruitier, sweeter spiced rum, Sailor Jerry is spicier, a touch more bitter, and more complex than others on the market. Acrylic barware courtesy of JCPenny. This entry was posted in reviews, rum and tagged best rum for cuba libre, best rum for rum and coke, sailor jerry rum, sailor jerry spiced rum, spiced rum on June 5, 2015 by Greg.